LONDON - How rare, the two brothers have something in common: both of them love Mario Balotelli. Noel Gallagher has been limbering up for his solo career with some verbal sparring. He is going to be a full-time frontman for the first time in his life with new band High Flying Birds - and he's not afraid to admit it's a big step. And the married dad of three, who refused to confirm or deny if he was a member of a secret society [do you remember the old post about it...], thanked God that Manchester City had sold their soul. Noel's days of sprinkling drugs on his Cornflakes are long gone. But his sharp-tongued mischief remains as potent as ever - as these answers prove. How do you go about telling Simon Cowell you don't want all the money in the world to do X Factor? Money was never mentioned. I told him he didn't REALLY want me on there. He insisted he did. I insisted HARDER that he didn't and he gave up asking. My 11-year-old daughter has never forgiven me. Are you planning an autobiography in the future? What would you call it? It's very much in the pipeline. It's gonna be called Sad But True... The Rise And Fall Of Noel Gallagher. Has the way you write songs changed since you became a dad? Nothing has changed really except maybe I get less time than usual to write. "A good thing too," some Guardian readers might comment. Aside from The Beatles, what band do you wish you could have been in and why? You said a few years ago that you were a fan of Meerkat Manor. What's on more in your house - Sky Sports News or CBeebies? Which decade was better for you professionally and personally - the Nineties or the Noughties? What? Is that a serious question? Professionally The Nineties, of course. Personally, the Noughties. I hate that term. What is the best football song/chant you have heard? Dunno about the chant but you would be hard pushed to beat the Poznan. Would you ever get more involved at Manchester City - like joining the board of directors? Nah. They're doing a magnificent job up there. I wouldn't mind being a mascot for the day though. If there was one album written by someone else that you could claim as your own, what would it be? Will you do more radio shows with Russell Brand in the future? I'd love to. There have been rumblings between Russ, Matt Morgan and myself. It's pretty much up to Brandy boy, though. We'll see. You were at the Arthur premiere to support your pal Russell. Did you walk out? If not, why not? What was your reaction when you heard that the Pretty Green store had been ransacked in Manchester during the riots? Every cloud and all that, eh? What did Robbie Williams' email say the other week? Can't remember. Words to the effect of: "I'm sorry for being such a knob." What would it take you to go on I'm A Celeb? And what's your dream line-up? Could Shaun Ryder's appearance ever be beaten? What would it take? £5million and all the Star Bars I could eat. Who is the first person, other than "the missus", who you play new music to? Are you member of a secret society? Have you been invited to stay with the King Of Tonga yet? Nope, never actually met him. I could only feel his presence. If your lads started a band when they are teenagers, would you encourage them or tell them to get a proper job? I'd say go for it. Music is a wonderful thing. Was there ever a moment in Oasis when the band were making demos or recording and you said to yourself "I'll have that song for my solo album"? Would you ever consider collaborations on your future solo albums? 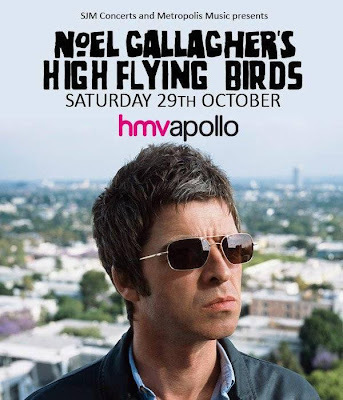 What about Damon Albarn appearing with High Flying Birds? Or Noel Gallagher on a Gorillaz record? What A Life is a dance track - what will that be like on stage without a guitar for protection? It'll be like that scene from The Office. Not the bit where David Brent does his dance. The bit before that where his new boss cuts some serious rug. I've got moves that are gonna destroy. Nope but I'm thinking of having a right good crack at it. I quite fancy a little bubble car. How are you getting on with your iPad? We hear you are beginning to embrace technology beyond just text messages. If I'm being honest, I wish I'd never bothered. There's a lot of unnecessary nonsense that comes with computers that I could have done without knowing - like the language. None of it makes any sense. Do you own any hip-hop records? Do you rate artists like Tinie Tempah and Plan B? Old school hip-hop pre-Nineties is more my kind of gear. My kids love Tinie. Are you looking forward to getting out on tour? I am and I'm not. I am because my record is great and I think people will like it. And I have an obligation to play the songs live. I'm not because I have to learn how to be a front man. Have you given up wild nights out for peach fizz and the healthy lifestyle? Put it this way, laughing boy. On any given night I'll be having it more than you. Is it true you have a personal trainer? Yes. His name is Tuff Levi. He invented the "reggae, reggae work-out". The world will witness the fitness on the tour come October 23. Is Sergio Aguero the best ever to wear a Man City strip? Mario Balotelli would make a decent drummer. He's bananas. Which players' names have your kids got on their shirts? Best player was the mighty Jo. I love Super Mario. Total force of nature and style icon. My kids don't wear football kits. When they ask, they can have one. Not before. Have Manchester City sold their soul? Would you go for drinks at No10 if David Cameron invited you? Oh yes - no question. Those Bullingdon boys look like a bloody good laugh. Someone described you as the Manchester Eliza Doolittle (from My Fair Lady, not the ditsy singer). How do you react? I've never seen My Fair Lady. So I'm not sure what that means. Who said that anyway - Gordon Smart? Will you send your sons Donovan and Sonny to private school? It's 15 years since Knebworth. Sum up your life since then.